Add a pop of color to your ensemble! 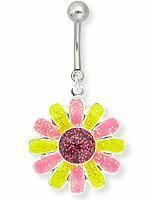 This belly button ring has a large flower with 12 glittery petals. The petals alternate pink and yellow in color, and the large center is a dark red color. This is an impeccable accessory for when you hit the beach, visit a music festival, or hang out with friends!